Finding a forever relationship is hard enough, but to have that emotional slate wiped clean then have to rebuild it from scratch with a man who now sees her as a threatening stranger is no easy task for NOPD detective Charlotte Caissie, but she doesn’t give up easily, not on the job and not in her suddenly crumbling personal life. As the heroine of my over-arcing “By Moonlight” dark shapeshifter series, Cee Cee isn’t always easy to like – she’s tough, guarded, driven by the demons of her past. But her redeeming quality, the one sure thing in her life, was always the love she shared with former mob henchman Max Savoie. Now, with his memories stolen by their enemies, will they be able to find their way back to what they had together? She spoke of trust like one who didn’t come by it easily, yet she’d allowed him access to her most intimate secrets, to her most private self. Max didn’t know much, but he understood how difficult that must have been, speaking volumes about what they’d shared, or so he wanted to believe. He needed to believe in something, something that would tether him in this cold, isolated spacewalk he was taking in the empty void of his past. Was that something Charlotte Caissie? Again, caution whispered to him, an intense self-restraint that must have come from somewhere, from some harsh lesson learned. Survival . . . that one forceful need seemed to drive him, the key to all he’d been, to all he was, a deep, desperate, clawing purpose rooted in fears that shadowed his soul, forbidding this trust his supposed mate spoke of, denying the insistent claims that he was safe amongst friends. Why did none of those things quiet the insistence that all was not well, that he was teetering on a precipice of disaster that would carry all he’d loved with him? If survival was the key, his memories held the treasure of knowledge locked beyond that wall of blankness. He had to get through or this woman, these people, this world he supposedly protected would all be lost, and that meant plunging into a vast unknown with only tentative threads of offered trust to hold him. While working on RISE BY MOONIGHT, the end cap for the series, I’ve been rediscovering the powerful draw of this unlikely couple. Light vs darkness, a life time of suspicion vs implicit trust, love vs loss, all tightly woven through the fabric of these books. It’s going to be hard to say good-bye . . .
What characters have you read or written that you’ve hated to let go? Happy Weekend and Happy Writing fellow Warriors! A decade ago, I envisioned a hero, a larger than life, mysterious, dangerous, silently predatory dark hero leashed by loyalty to the mobster who rescued him when he was a child, then shook up his world with the intrusion of two life-altering events – his infatuation with the fierce NOPD detective determined to arrest him and the sudden awareness that he was not the only one of his kind. 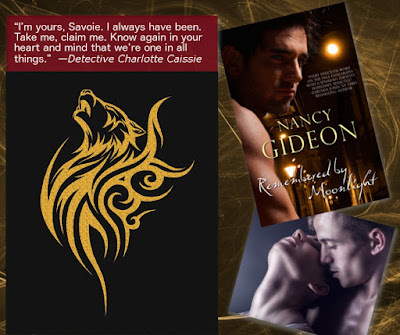 From deadly shadows to sudden limelight, Max Savoie became, through the first four books of my “By Moonlight” series, the Shifter King. Nine books later, Max was still the hero my readers wanted, petitioning me to bring him back. The marketer in me considered another angle to both appease my fans and to coax new readers who’d be leery of jumping so deeply into a series filled with intertwining plot lines. The set up was already there without me knowing it. The leader of the New Orleans shapeshifter clan had been taken by their enemies and put through grueling experiments that blocked his memories of who he was. Time to let him . 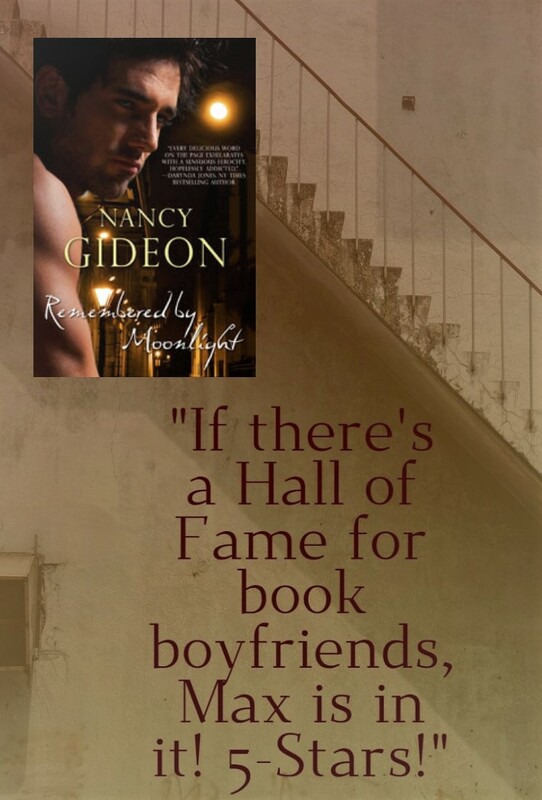 . . and new readers rediscover who Max Savoie really was in this first self-pubbed book, a clever but tortuous path for the heroine to take in this excerpt from REMEMBERED BY MOONLIGHT. She wanted Max, not this stranger wearing her lover’s face who, wrapped in his comforting scent, enticed with a touch both tempting and terrifying. It felt wrong, like the worst sort of betrayal to want what he offered. 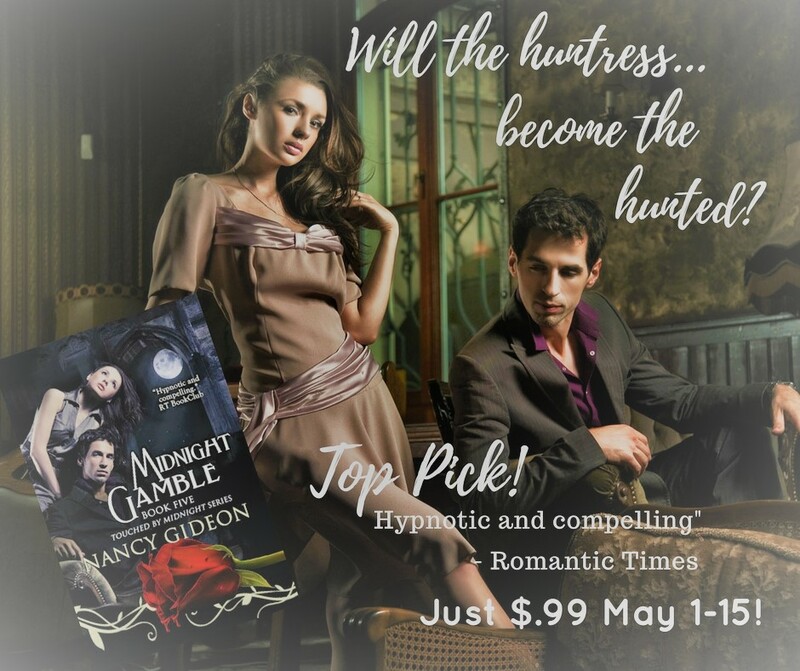 She wanted her Max, the sly, aggravating mob henchman who’d tangled around her investigations then about her heart, taming her objections with maddening patience and persistence. It was that Max she needed in her life, in her arms, in her bed, sharing the subtle innuendos, the dramatic dangers, the heart-pumping passions that bound them as friends, companions and mates. Her one and only, her forever love who’d defended her, depended upon her, who completed her in every way possible. He might look the same, smell the same, sound the same but the deep, unique traits that had claimed her guarded heart and battered soul were missing, stolen not just from him, but from her as well. To accept this hollow substitute would be giving up on all they’d created between them. She wasn’t ready to let go of that past they’d planned to build a future upon. The man in her living room was an enemy who’d locked the one she loved away in a prison of forgotten dreams, and it was time to smash down those doors to let the real Max free. Next week, I’ll give Charlotte Caissie equal time as the other half of this romantic duo. Until then, enjoy a teasing glimpse of REMEMBERED BY MOONLIGHT . . . Finally, a week without driving peril here in Michigan. Hope you all are staying warm and at the keyboard. Happy belated Valentine’s Day and Happy Writing, fellow Warriors! Now that I have your attention . . . This month’s Insecure Writers Support Group topic asks what creative outlets we enjoy other than writing. Growing up with an occupational therapist for a mom, there was nothing crafty I didn’t know to do: sewing, knitting, crocheting. I loved to draw – horses, mainly when I was young. Those pictures led to making up stories to go along with the adventures I depicted on long rolls of paper my dad brought home from work. But those fun activities fell by the wayside when the 9-to-5 then children came along. By then, I was writing novels, and as newsletter editor (for life – I have a plaque from MMRWA that says so!) back in the days of cut, paste, photocopy and mail, I discovered an exciting new outlet – graphic art (okay, there was some teasingly graphic writing going on as well, but that’s another story!). Dinosaur computers had limited text and graphic resources, so I was thrilled when my then-hubby brought home an older version of PhotoShop from the graphic designer at their print shop. Mind blown! Mind you, this was very simplistic compared to what we have now but then . . . borders, arcing sentences, fonts galore! Graphics! COLOR and shading! The young, budding artist in me was reborn. That love affair continues now that promotional material is such a huge part of being an author. I adore combining book covers with Dreamstime/Deposit Photo stock art and quotes/promo info on Quotescover and Canva to create my own promo such as social media posts and bookmarks, and to assist in cover and book trailer creation. Just this past weekend while at a Write In, I learned about several more fun ways to play with that information. I’m still a novice who loves taking my words to a higher visual level. And I still have to remind myself, the writing comes first. But this side gig is a blast! So, what’s your hidden talent? Posting: The first Wednesday of every month is officially Insecure Writer’s Support Group day. Post your thoughts on your own blog. Talk about your doubts and the fears you have conquered. Discuss your struggles and triumphs. Offer a word of encouragement for others who are struggling. Visit others in the group and connect with your fellow writer - aim for a dozen new people each time.The awesome co-hosts for the February 6th posting of the IWSG will be Raimey Gallant, Natalie Aguirre, CV Grehan, and Michelle Wallace!